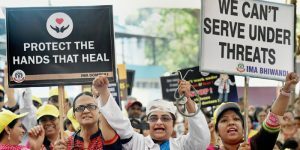 The recent strike called by the Resident Doctors forcing hospitals to turn away the patients, thereby depriving them of emergency medical services has raised many issues. Firstly, violence of any sort on anyone is not condoned. The attacks on the resident doctor at Dhule should be condemned. After which there were few more attacks. Before presuming all patients and relatives coming to public hospitals are aggressive and should be blamed, one needs to understand a few facts. The resident doctors are studying in colleges where usually NOT anyone gets admissions. Moreover they get the best of experience at these government hospitals, where these very poor come to get treated. The conditions are pathetic, poor are denied the basic medical care, 1000 times the number of patients come, while there are dedicated beds for only a few. All the hospitals run on the resident doctors. Everyone knows that and acknowledges it. But now starts the problems. They have come to these medical colleges to get best of medical education at affordable fees and avoid capitation fees. Their education is subsidized and taxpayers like us are funding their education. They forget this fact the minute they become doctors. There is no indebtedness to the society. Then they become money-making machines. Many a doctor and their families are out to make up for the expense of their education, which is by far more affordable had they studied abroad, and the aim is to have a flourishing practice. Fact number two -The very government that has denied the security and protection to doctors has denied more rightful and basic a service, health care to the millions of poor. The level of frustration that the poor have to experience I am not sure anyone of us can even imagine it. The resident doctors are primarily middle-class, upper middle class and the rich. Each has at least one vehicle in their families. They have no clue of long distance travel in public transport borne by patients The patients often do not have the knowledge of their illness, worse they do not have money to afford. For them doctor is a miracle performing person or may be even god. That however was an image even perpetuated by many doctors. It is now in the last 5-8 years that educated patients, media pressure that doctors do not get offended when asked questions. Otherwise how much was an interaction? Patients are discouraged from asking questions to the visiting doctor on their rounds. Why? Who is s/he, god? They are answerable and the patient has to know progress of treatment and status of their illness. Things are changing now, but it is nowhere near than what it is in progressive countries. Fact three – The hospitals have plans and rooms as per these plans. The doctors are paid fees as per these plans. Now begins the racket. The doctors fight (and I have witnessed it, has happened with my own father’s case), when the patient has to be given discharge, the visiting doctor insists it is done beyond noon in private hospitals. Now it is not for nothing they say it helps to know a doctor. Thankfully my cousin and his wife, who are our family’s medical in-charge literally had cautioned me of this and pushed me to go to the cashier before noon. It was shocking that my father’s doctor threw a anger tantrum. My father has not forgotten it till today and once when he was to come home to administer him an injection, called him and told him off. He refused and said he will not take it from him. The doctor realized my father’s predicament and the fact here was one intelligent man asking him far too many questions. But that is how it should be. Poor do not have these sensibilities because they are not aware, deprived of education. Fact four – the distances in small towns and villages are far too long. As I said, the poor often do not know what is happening to them, the doctors at the public health clinics make rare visits, if at all. Tell them off, give some pills. Once they bring them to the first government hospital they wrongly expect the doctors to drop everything for them. Moreover they expect miraculous effect. Now in Dhule the doctors told the patients relatives of the fact which they refused to accept. Because we also need to understand this time the doctors were right, but it has happened in cases the doctors do not encourage patients admissions at nights or early mornings. It has been reported. That definitely does not give patients or relatives right to beat them up. Fact five – there is lack of security measures and facilities. Again, the government has denied these. But here the deans of these hospitals have a role to play. The resident doctors need to tell their authorities of these lacunae. If not provided then have the guts to stand outside the minister’s bungalows and demonstrate. Shout slogans there, but no. They will not do such. When we media asked them to do so and said we will extend support if they do this, they told us they can’t do so. They need the help of the government. If this is the stand they are taking and then resorting to extortion of depriving those very patients who are angry with them, then they are to be blamed for this situation. This is not the way to protest or raise pertinent issues. Fact six – you sow what you reap. Have people witnessed the bullying by seniors on the junior resident doctors? Last year I visited my niece in Nagpur, who is studying MD and was traumatised. Both her parents are MDs and as I said, my family’s medical in-charge. The stories she told me of the harassment she was put through by her lazy seniors was not shocking, it only angered me. The seniors insult the juniors in the ward, they speak to them rudely and in the case of my niece they slapped a file on her face. As a result, expectedly, few patients and their relatives began speaking to her rudely. The others took pity on her and said she needed to give back. I had to grill her to raise these points with the dean, who had been asking my niece why she lost the smile on her face. I finally gave an ultimatum, told her if she did not, I would do a sting and tell the dean I am a senior journalist and will expose them. This is the harsh reality. These doctors perpetuate such behavior and they are closely observed by the patients. If they fail to understand these multi0-layered issues which are highly influenced by socio-cultural and political factors then it is a huge mistake. Fact seven – the politics of this issue is deep. The obvious is depriving the poor of essential health services, mutli speciality services and give proper health care. Worse is the mutual benefit racket that exists between the deans, doctors, government, media and the rich. Many who can afford modern medical treatment take favours and get treated by the top doctors of the city in these government hospitals, to save their money. The politicians use their muscle and pull. Then these politicians have used the uneducated poor to provoke them in the name of the ‘sons of the soil,’ ensure they remain the disruptive elements in the society and are used accordingly. The idiot poor do not realize the ramifications of their action. The media too sometimes plays a crucial role. There is a very senior Marathi journalist, who still works for a Marathi newspaper. He was THE one who provoked the Shiv Sainiks at Thane to go and destroy the Singhania Hospital at Thane. When the Sena leader Anand Dighe died, the doctors had given one last shot to save him. And when they got angry and protested, this so-called political journalist told them, “Baghtay kay, jaa jala/toda hey hospital.” The sainiks went on a rampage and the hospital was forever destroyed, patients were injured and a child even died in this violence. Any violence should be condemned. But when politicians and certain political parties have specialised in using violence as a means for bargaining and getting their demands fulfilled then sorry, the followers and population is going to do exactly just that. This whole situation of beating doctors and their strike is rather complexed and multilayered. Sadly like today’s young journalists, the young doctors do not know of these complex issues. The number of players, the manipulation of their own senior doctors and deans and then they would care. Such things most youngsters wish to stay away from and are encouraged by their families too. But if they do not care to understand, I agree with what CJ Chellur says, holding poor to ransom will only further intensify their emotions. They will go a step further to beat. The doctors have a bigger role to play in putting an end to this whole issue. The standoffish attitude needs to be replaced by more sensitive one.